IMPORTANT: We have placed cookies on your computer to help make this website better. You can change your cookie settings at any time. Otherwise, we'll assume you're OK to continue. This is a collection of song titles gathered together, in no particular order, to pay homage to the forgotten, unheralded or “lost” recordings that preceded what we have come to know and love as “hit” songs. In earlier eras, it was not uncommon for a song to be recorded multiple times by different performers and, then, simultaneously compete for radio airplay and popularity (e.g., “Unchained Melody”). More commonly, some songs have had multiple recordings produced before one or another version becomes “the hit” (e.g., “Let Me Be The One”). 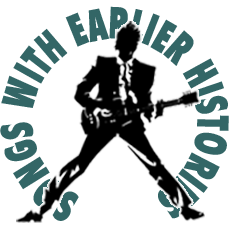 Also, certain songwriters became known for writing hits for groups but whose own recordings went nowhere or nearly so – e.g., Mark James (“Suspicious Minds“), Laura Nyro (“Stoney End” and others) – but this would happen less often in the era of the Singer-Songwriter. Songs, too, would also be “borrowed” from one of the vernacular charts (e.g. R&B) and re-recorded by a mainstream performer into a mainstream hit. I began compiling a list of original song versions some years ago when I was the program director for a Singapore radio station, producing the occasional music special program. Thereafter, my list languished for years, until the expanse of the Internet opened up whole new avenues for research and discovery via Wikipedia and YouTube (in addition to already-published reference material, including Joel Whitburn’s series of Billboard music industry chart histories) and research-based sites such as Second Hand Songs. Please note: I have provided YouTube hyperlinks for song versions, but these links come-and-go. If one should disappear, you can easily use artist and/or song title keywords to search YouTube or iTunes for a replacement. Best regards, and the hits just keep on comin’!